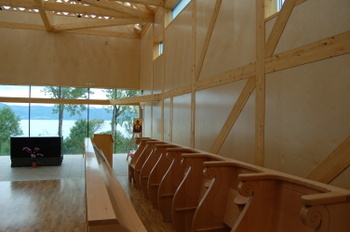 The church at Mariaklosteret, the Cictercian Monastery on Tautra island, out in the Trondheim Fjord. I took part in the midday prayer there yesterday, and afterwards had lunch inside the monasery. Not with the nuns, they have their own diningroom where visitors never come. But in the guest kitchen, a diningroom for people who stay in the monastery guesthouse for a shorter or longer time. Many years ago, when I worked on my book about Lent, I stayed in the monastery for a week, and had my lunch here every day. The other meals I prepared myself, in the guest house. I have been back to the monastery many times since then, but never for a meal, so to be able to do that yesterday, felt like a rich blessing. I have a very special tale to tell from my week in the monastery, in January 2007. You can read about this tale, my Violet Dinner, here. I never included the tale in my book, at the time it was too personal. I regretted that descision afterwords, but have shared it many times when I have been around, talking about the book. The meals at Mariaklosteret are simple, but every mouthful you eat is a mouthful filled with prayers. Summer, Sunday and a trip to the monastery island of Tautra, Terje, I, my parents. The new monastery at Tautra opened in 2006 (you can read the whole interesting history here), and since then the nuns and their friends have worked hard to create the garden surrounding the buildings. Do you know this yellow flower? In Norway we call it marikåpe. The Latin name is alchemikka vulgaris. The monastery at Tautra is a Mariakloster, a St.Mary monastery. I love it when plants and flowers are used to tell something. One day I would love to create a Biblical Garden in a corner of The Blue Garden. In Trondheimsfjorden there is a small island called Tautra. A monastery island with ruins from a medieval monastery, a running monastery of today, a few farms and a guesthouse called Klostergården. Klostergården has a charming restaurant with the best salmon in the world, and when we have guests from abroad, we often take them there for a lunch. For two days I have been at Tautra, stayed on Klostergården. Not with friends fro abroad, but with a group of colleages. We came out there with two impofrtant missions; to celebrate a birthday and to work together. We wanted to have a birthday party on the beach, but as the day came close we understood that the weather gods did not cooperate. I contacted the owner of the guesthouse, asking if it would be possible to find a place where we could prepare our food, and to my delight I got a message back - "the restaurant closes at 6pm, the kitchen is free for you to use "
The birthday boy, 65 years old Søren, an artist of life, was in charge of the three course dinner, with paella as hovedretten, the main course. With Søren as the chef we all took part in the cooking process. An easy task with a kitchen view like the one at Klostergården. The starter, mango, avocado, shrimps, mussels sprinkled with herbs, balsamico and oil. .....I completely forgot I had a camera. Thank you Ståle for your hospitality! We drove from Trondheim in the early morning. In rain and cold. I knew though, in my heart, that Tautra would be sunny. Deep in my heart, well, at least in my dreams, I knew. The sun would be shining. It couldn't be anything else. A colleague drove. We were four in the car and so busy talking about work topic, I didn't even think of looking out the car window to check the weather. Tomorrow (Friday) is the day of the funeral of my dear friend. Tears and blessed memories. Hand in hand. we give you our thanks oh Lord. My problem was in "You, who listen before we pray"........what is the use in praying at all if God listen before we pray.......what is the use of talking to God at all? I am learning along my path of life and today I know it to be true. God listens before I pray because He knows my needs before I do, and when I realise and startspraying it is so much easier to see that God already is there. Walking my path together with me. Some days pushing me ahead, some days carrying me, some days with my hand in his, some days just there beside me, quietly. Today was one of these days, when he listened before I prayed. I have been at Tautra, the small island in the Trondheim Fjord with the old monastery ruins and the new Maria (St.Mary) monastery. I was there for a conference for work, but in between I had time to walk the whole island. In prayers, talking with my Creator. God surrounded me with his love and comfort. Walking their paths side by side with God. At Tautra, a tiny island in the Trondheim Fjord, a small group of women is walking their paths hand in hand with their Creator. The women, originally sent to Norway by Our Lady of the Mississippi Abbey in Iowa, came to Tautra in 1999. Since then the group of 7 nuns has been living in a small farmhouse, but a few years ago the resolution was taken to built a new monastery. Tautra has a long history with monasteries. Around 1200 a Cistercienserchurch and monastery was built here, and played an important part of the religious life of the Trondheim area untill the reformation came in 1537. 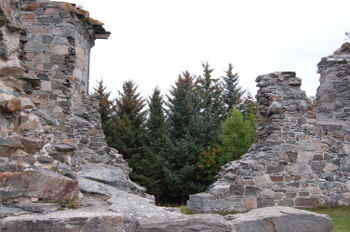 The ruins from this abbey can still be seen and visited at the island. The new monastery is now finished. The official opening will be in spring 2007, and this September the nuns are opening up the whole monastery and inviting people in. We went there today. Took part in the prayer at "non" (the 9th hour), met the nuns, walked around in the different rooms and visited the soap factory. The Soap from the Tautra monastery is famous, and an important way for the nuns to raise money for their monastery life. 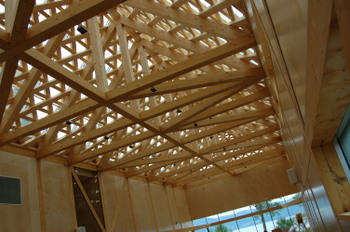 The monastery has its own webpage where you can read more about the history and the building progress. As a protestant, monastery life has| always been alien to me. But as I grow older I am more and more fascinated by it. I can never become a nun, but spending a part of my life in a monastery, far from my worldly responsibilites, close to God, a life in prayers.....yes, I could really do that.